This 3-tier bowl stand comes in a branching design that will add a beautiful natural touch to your kitchen or dining room. Flowing textured metal branches distinguishes this earthy 3-tier bowl stand from the rest of the crowd. Despite the unconventional, frenzied design, this stand is a convenient way of organizing your stray dining goods. It comes with three glass bowls, which can be attached to the stand with the suction cups built into the design. 17" wide x 12" deep x 12" high. Weighs 7.9 lbs. Each bowl is 9 1/4" wide. 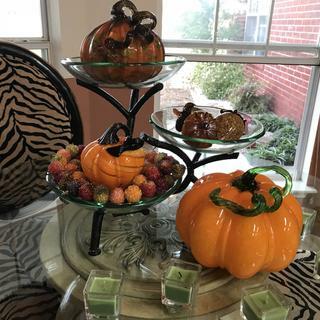 Three-tier bowl stand with three glass bowls included. It is attractive and well designed. It will be perfect for the dining room table. Compliments a lamp I purchased from Lamps Plus a while ago. Always pleased with Lamps Plus. Because it’s pretty. JK, it looks like it will fit nicely into my beach themed decorating. Functional and interesting to look at. Love it! Well made. Top notch in every way! Showed up very quickly! I have ordered many items from lamps plus and have never been disappointed! Fabulous! We love them ! It’s working as fruit bows in our kitchen.